Attention No Diving Sign - 12x18 - Rugged rust-free aluminum signs for indoor or outdoor use. Made of heavy-gauge reflective aluminum with anti-weather and anti-graffiti protection Available. Swimming during the summer time is one of the most popular activities to do for both kids and adults. 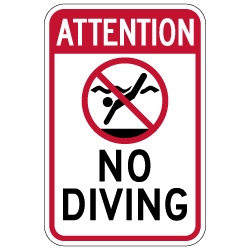 Manage your property and maintain safety with this easy-to-read NO DIVING sign. Displaying our No Diving Signs is an excellent first step in limiting liability concerns and improving safety on your property. Posting No Diving Signs is a great deterrent for reckless behavior and will prevent any injuries caused by swimmers diving into a shallow pool. Our signage is very popular to use for hotel pool and spa areas and can be used for public swimming pool locations for local businesses and residential complexes.